In mid-September, we adopted two kittens from the same litter. The adoption was through Angel’s Wish http://angelswish.org/ in Verona, WI. They were nearly six months old at the time, curious and full of energy as most kittens are. When we first met them, they were very interested in T and pretty much ignored me, which seemed like a bad omen. As it turns out, they follow me around all the time these days, so those fears were thankfully put to rest. I had my doubts. 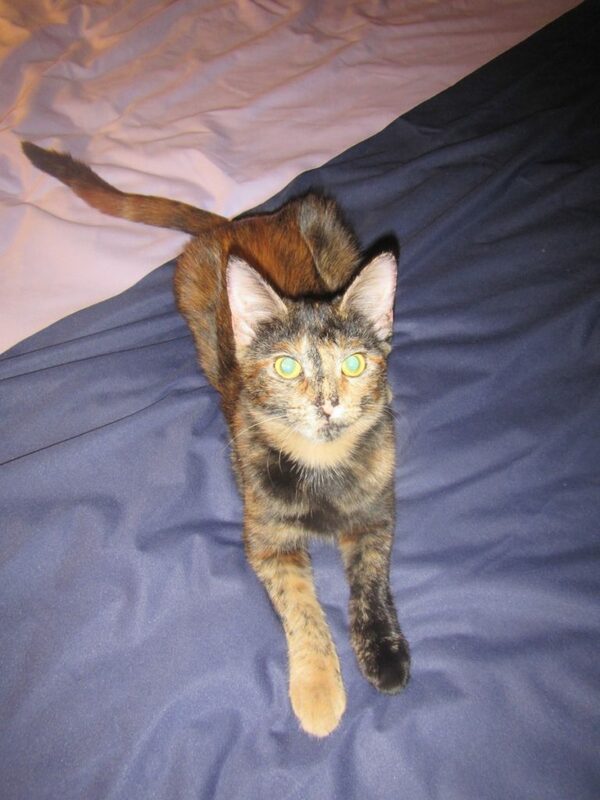 Our intent had been to adopt an adult cat, since kittens are much easier to re-home. But T fell in love with these little clowns, and I had to agree they were pretty great. Another doubt I had: I grew up with dogs, and miss the goofy sort of companionship that dogs naturally bring. After much soul-searching, we agreed that a dog wasn’t a good fit for us. While I am home much of the time, when I travel to conventions, a dog would be alone in the house for hours at a time. And T wasn’t confident about her ability to walk a dog — especially a larger dog, which I wanted — without getting dragged along when a squirrel happened by. Cats are simply lower-maintenance pets, especially for folks living in a city. Fast forward two weeks: I was awakened by Mina, the tortoiseshell girl, climbing up onto the bookshelf headboard above my head. She flopped down. Mina is a bit klutzy. 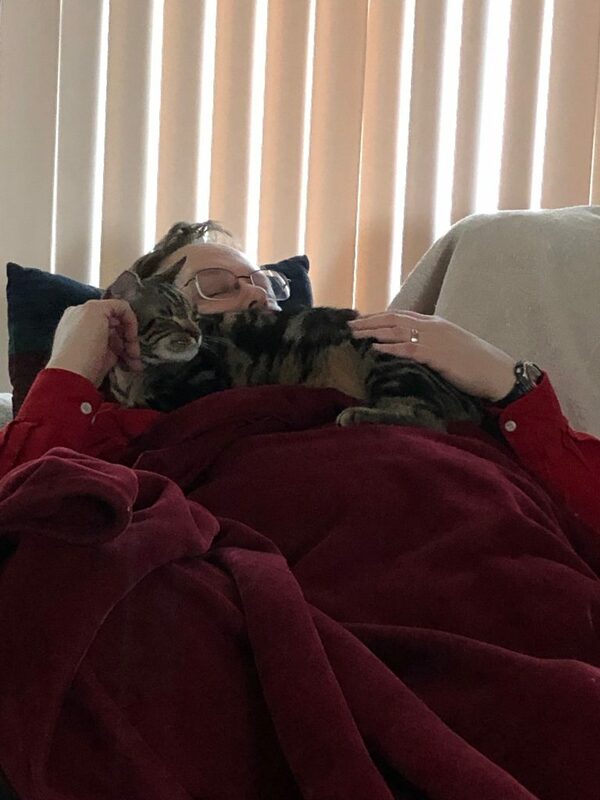 The next thing I heard was the sound of kitty fur sliding: I looked up to see her back feet — toes spread and claws out — falling directly toward my face. 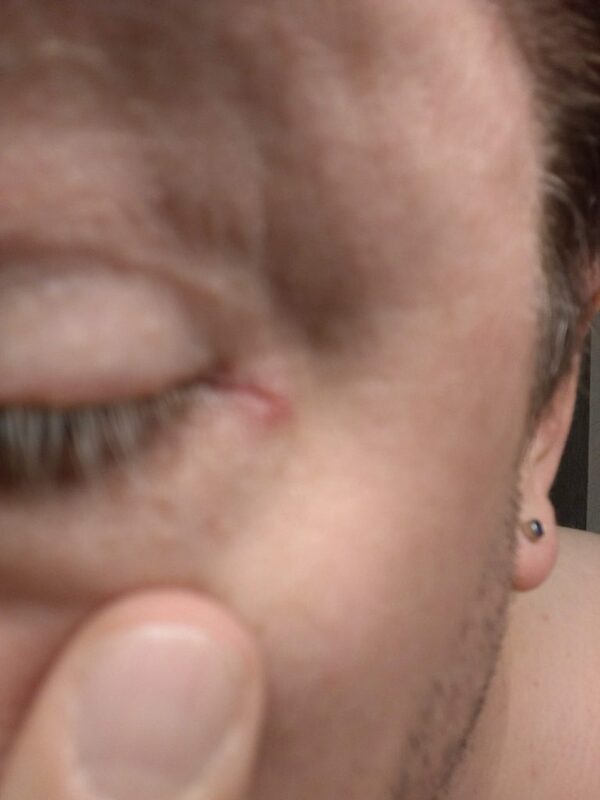 I flinched just enough that I didn’t lose my left eye. The emergency room visit was anticlimactic; it was decided that I didn’t need stitches. The gash was in an existing crinkle, and would heal up very well on it’s own. They were right. Mina and Monty just turned one year old at the end of March. We’ve had them for six months now, and despite my earlier misgivings, I wouldn’t give them up for anything. They are exceptionally sweet, highly cuddly cats, and they love to hang out with us – just being in the same room is often enough, though more often than not, they want us to play with them. We made the decision not to front-declaw them, and while my hands regret this decision from time to time, I think they’re happier and better adjusted for it. Monty has become my buddy: he follows me out to the kitchen, stands on his hind legs and pats my thigh, trying to get my attention. When I reach down to give him some face/chin scritches, he purrs and soaks it up for a few seconds, then drops to all fours for a moment, and stands back up again for more scritches. Mina waits outside my office door — sometimes for hours — until I re-emerge and roughly scruffle her fur all over. We have to keep the cats out of my office, because I have houseplants in there, and one or two are toxic to cats, not to mention the damage these perpetual-motion machines would do to typically slow-moving plant life. They’ve grown too. We bought a three-foot tall scratching post, and one of the favorite games was for me to put a toy on top, which they would then climb up to and knock down. Nowadays, they don’t have to climb; they can walk their front paws up the scratching post and knock the toy off without their back feet leaving the floor. They’ve also put on some weight — Mina especially. 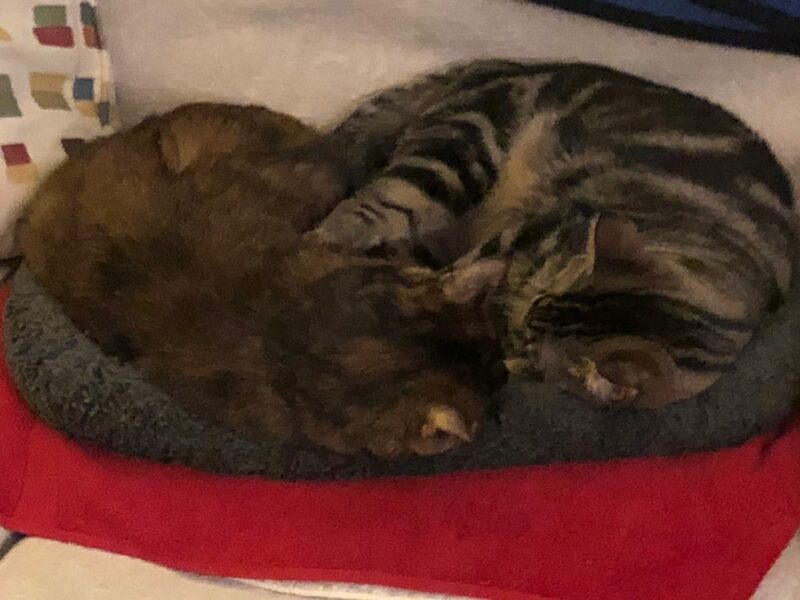 Our theory is that Mina may have been the runt of the litter: she’s extremely food-motivated, and though Monty gets plenty to eat, we worry that his sister may elbow him out of the way a little too often. Mina – always alert (though much larger now). Pets add so much to our lives it’s difficult for me to imagine life without pets in the house. I miss all our previous kitties, but I’m glad we gave these two a home, and gladder still over how much they seem to enjoy being with us. Hopefully, they’ll be with us for many happy, comfortable years to come. I do miss having cats in the house, and yes, living without them after 24 years is a strange thing. I often open a door expecting to see a cat. I wish for a warm kitty on my lap some days. But I’m allergic and after our last cat passed away in a bad illness, we’ve gone without. I do enjoy living the cat life through my friends! Great to see them all grown up, Bill! That photo of you & Monty is great. Ah, the kitty life! As in, how good is it to be a cat in your house, and also how good it is to be able to relax with your cat buddy.